RUSH: To Albany we go, and this is Sal. Great to have you, Sal. What’s up? What’s shaking? CALLER: Hey, thanks, Rush. To one of your earlier points, not even Obama believed his policies would contribute to the recent economic success. I say that because when he was on stage back campaigning for Hillary, he was asking his audience, “How does Donald Trump plan on bringing manufacturing jobs back to the states?” And he says sarcastically, “What is he going to do, wave a magic wand?” He wasn’t touting his prior policy. He just looked so unqualified at that moment to talk about economics and how to grow an economy, just like so many unsuccessful lawyers where their fallback in this country is conning American people, getting elected, and having the perks that come along with it. Do you agree? RUSH: I think… (interruption) No, no. I think this is a good point. He’s referring to the point I made in the first hour about the economy vis-a-vis the shutdown. I mean, the economy is roaring and the stock market. They hit an all-time high after the shutdown deal was signed, after the votes, after we were assured the shutdown would end. So the Dow right now is at 26,138. And then I mentioned — and it’s important to mention again — we’re just in the early stages. Apple is repatriating a net $210 billion. You talk about a stimulus? Then they are gonna add another $350 billion in investment in the country by building a new headquarters and employing 20,000 people, 20,000 new employees. So Apple is looking here at an infusion of a little north of half a trillion dollars, all because of what? The Trump tax cut! Apple had no choice, whether they wanted to or not. The responsibility to shareholders requires them to bring home that money — $250 billion parked overseas — because of the American tax rate 35%. There’s a one-time repatriation rate of 15%. 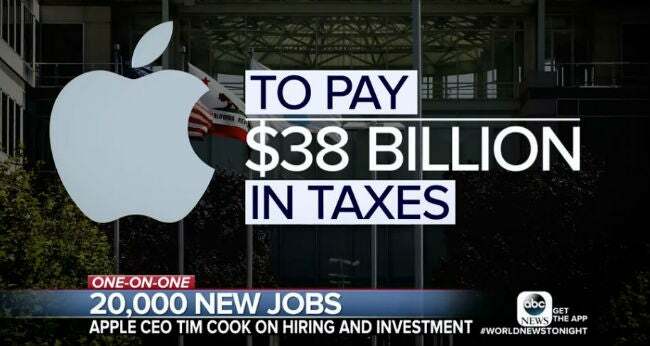 So Apple is gonna pay $38 billion in taxes, and that net is gonna be repatriated plus the $350 billion. I call it “the Reverse Limbaugh Theorem.” Remember what the Limbaugh Theorem was? That Obama positioned himself as outside the government. Because when the economy was tanking, when the economy was going down, when the economy was stagnating and when we were hearing that Obama’s the perfect guy to manage the decline, I was stunned that Obama was not getting any blame for it. That Obama, in the polling, was not being hurt by a plunging, declining economy, and I chalked it up to the Limbaugh Theorem. The Limbaugh Theorem is that Obama is not seen as responsible for it. They keep talking about the mistakes George W. Bush made. And Obama is this great warrior, and he’s just arrived, and he’s working as hard as he can to reverse it. But they lied to him! They didn’t tell him how bad the economy was when Bush transferred the keys to Washington to him, and so Obama’s been working feverishly, but he’s only can do so much. So the Limbaugh Theorem was Obama stands aside; appears to be outside. So then that’s what the media is reporting, and that’s what people in polling questions are responding to. It’s not gonna hold up, though. Obama has no relationship. Obama’s fingerprints aren’t on one instance of economic growth. It’s not what they wanted, folks. Sal here is right. Obama told all these people in Indiana and Ohio that these manufacturing jobs weren’t coming back. (impression) “Trump’s got this magic wand? What’s he gonna do? How’s he gonna make it happen? Can’t! Those jobs are gone.” Obama didn’t even try to make people think he wanted those jobs to come back. Now he’s out there claiming credit for it? It isn’t gonna last, folks. RUSH: Bob in Coronado, California. Great to have you with us, sir. How are you doing? CALLER: Doing great, Rush. My question revolves around this Apple situation, 120,000 people are getting a very sizable bonus. Many of them are Millennials/Gen Y people and so forth. Of course, the real base of all these bonuses expands into millions of people. But just focusing on the Apple group sort of answer my question, and that is many of these kids — and I see many Apple Stores. They’re hardworking kids, but I guarantee you they’re liberal as they can be. They’re fresh out of college. CALLER: And they are hopelessly liberal, and you could never talk ’em into being conservative in a million years. Yet do you think a $2,500 bonus could possibly start undoing that? RUSH: Boy, I so hope so. I hope this kind of thing has an impact. I have hoped for things like this for I can’t tell you how long. Here you have a bunch of people who have been raised liberal, and who’ve been propagandized, and American corporations are selfish and evil — except the one they work for. They’re selfish and they’re evil and they’re rotten and heartless and all that and they don’t care about health care! They don’t care about climate change, and blah, blah, blah, blah, blah. And then all of a sudden here comes a bonus, here comes a raise, here comes expanded benefits, and it’s all because of Republican tax policy. You would hope that this might go, “Wait a minute. This is not the way I have been taught.” Now, if they’re thinking people, that might happen, but if they’re the product of emotional propaganda, if they’ve been… If they’ve been emotioned, for lack of a better word, into being liberal, then this is not going to be the magic wand that you would hope. But a continuation of these kind of things can have an impact that we may not see immediately, and that’s what I hope for.